Most orange and other citrus trees in Texas are grown in the Rio Grande Valley, which is in the southern tip of Texas and is comprised of four counties: Cameron, Hidalgo, Starr and Willacy. The region falls into USDA hardiness zone 9b and is an excellent spot for oranges, which require high heat to form sugars. Temperatures in this area can dip to 25 degrees F, but the region is hot and humid in the summer. Considered the best eating oranges, navel oranges are available in many varieties, but all have thick, easy-to-peel skin. The fruit gets its navel from a secondary fruit that is embedded in the orange blossom but dies off. The spot at which this secondary fruit was attached to the orange creates an opening, making it easier than most oranges to peel. Navel oranges are sweet and require high heat to develop high levels of sugar. Texas, Thompson and Washington varieties all grow well in South Texas. 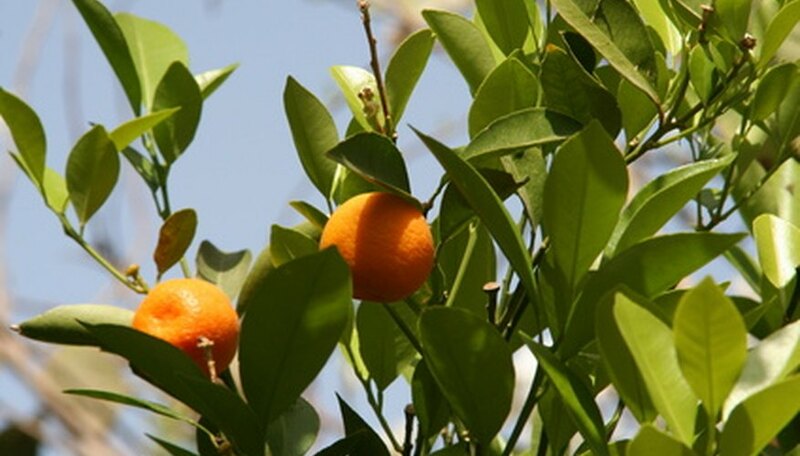 Trees that produce navel oranges require full sun and moist, well-draining soil. Among the least cold hardy of the orange trees, the pineapple orange is a good juice orange that is ready for harvest between December and February in South Texas. This orange has a deep orange, medium thick skin and vibrant orange flesh. The fruit, which may drop to the ground after ripening, has seeds. The pineapple orange tree is more susceptible to freezes than many other orange trees and may bear fruit in alternate years. Pineapple orange trees require full sun and moist soil. The most popular orange grown around the world, the Valencia is a premiere juicing orange. The Valencia originated in Southern Europe and was introduced to the U.S. in Florida in 1870. The fruit, which is average size, has a medium-to-thick, deep orange skin that is easy to peel and is a good eating orange. The flesh of the Valencia is juicy and nearly seedless. Valencias may be harvested beginning in mid-winter in the warm Rio Grande Valley. This tree requires full sun and moist soil. J.D. Chi is a professional journalist who has covered sports for more than 20 years at newspapers all over the United States. She has covered major golf tournaments and the NFL as well as travel and health topics. Chi received her Bachelor of Arts in professional writing from Carnegie Mellon University and is working toward a master's degree in journalism. What Is the Correct pH Level for a Peach Tree?